The present lot is the brainchild of artificial intelligence artist Ben Snell. He trained his computer, named Dio after the Greek God Dionysus, to become a sculptor. With practice, Dio developed its own style and, inspired by the classics, invented the present lot. 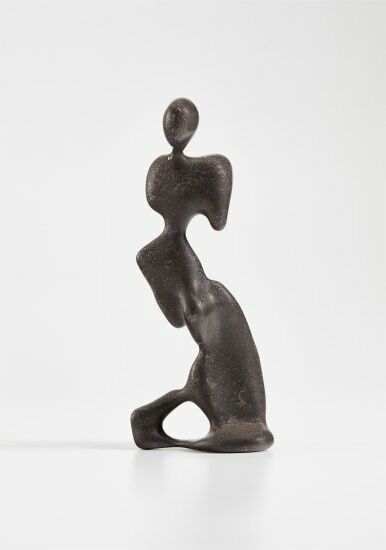 This physical form possesses an uncanny figurative quality distilling the essence of Greek and Roman sculpture while hinting at the twisting forms of Constantin Brancusi, Jean Arp and Henry Moore. It questions the creativity, originality and agency of the machine. Not only made by the computer, the present lot is also materially made from the computer (Dio) that conceived it. Snell ground the computer (Dio) to dust and utilized it as physical medium, transforming Dio the computer into Dio the sculpture, fusing process and product. The computer assumes a newfound physical agency through reconfigured bits of silicon, copper, steel and plastic while traces of the computer’s past processing power live on within its bodily form. Just as classical sculptors worked in stone and bronze, Dio is a sculpture materially of our time, made from the raw materials of computation. Ben Snell is an artist based in New York. His practice investigates materialities and ecologies of computation. Using contemporary techniques in dialogue with traditional motifs, he situates technology as a mirror to reveal the self as a computational being. With emphasis on inquiry and introspection, his work takes the form of drawings, photography and sculpture. He holds a B.A. in Experiential Art and Design from Carnegie Mellon University and was recently an Artist in Residence at Pier 9 Autodesk.